Dr. Paul Haefner’s fifth and final sport psychology seminar titled “For Trainers Only” really was applicable to anyone who teaches riders or trains horses. 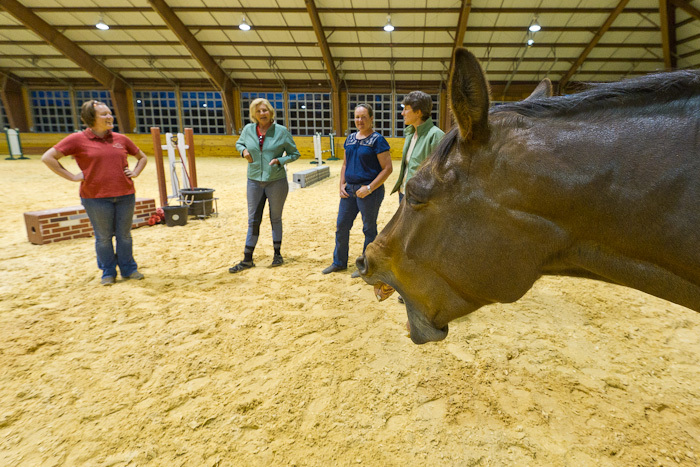 Paul employed two equine assistants, including his warmblood mare Maggie, for his seminar, which touched on the art and practice of teaching. He broke the attendees into pairs and then instructed them to move the equines, without touching or bribing them, into four separate enclosed areas. He then observed how the instructors worked with one another and with their students (the equines). It was fascinating to see how the different personalities of the people played into the scenario. Some trainers were more aggressive, while others offered creative options when things weren’t going the way they’d hoped, and a few realized their egos may have interfered with some of their instructions. In the end, I think everyone had an eye-opening experience and realized a bit more about themselves. During the discussion, Maggie made her thoughts known—for her, it was just another day at the office.